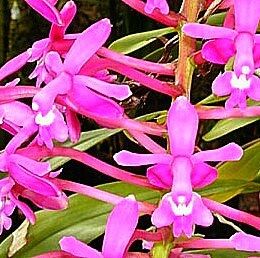 The genus of Epidendrum orchids contains over 1,000 different species which grow in subtropical and tropical areas of the United States, in Central America and in Argentina. Coming from the Greek epi (on) and dendron (tree), the genus name is a reflection of the plants’ growing habits. The majority of Epidendrum orchids are epiphytes, though a few are classified as lithophytes. One species, Epidendrum cochleatum, bears the distinction of being the first epiphytic orchid to bloom in captivity, an event that occurred in England in 1787. Epidendrum orchids vary widely in flora and vegetation. The flowers range from a quarter of an inch to six inches in diameter. Some plants produce pseudobubls while others possess cane or reed-like stems. Short bulbs are common in many species, while other species can produce bulbs of up to five feet long. Many flowers are fragrant and several bloom continually. These plants grow from sea level to mountaintops, in warm and in cool climates. There is one trait that all Epidendrum orchids have in common: stubbornness. They take all kinds of punishment. Give them bright sun, cool nights, too little moisture or too little light, and they soldier on. Some of this genus have even adapted to extended freezing conditions. You may wonder why so many dissimilar flowers were classified together, but there is a reason. When the genus was first established in 1754 by Linnaeus, it was established to include every epiphytic orchid known at that time. Epidendrum orchids grow well mounted on bark, but they can also be grown in pots using a coarse growing medium with lots of air spaces. Temperatures should be kept in the warm range, but can go as low as 50 degrees Fahrenheit. Humidity isn’t critical and the roots prefer to dry out between watering, although those with pseudobulbs need to be kept evenly moist during flowering. As mentioned before, except for the fragrance, Epidendrum orchids don’t usually have a lot to recommend them. That doesn’t mean that you should omit them from your orchid collection. Several species are quite beautiful. 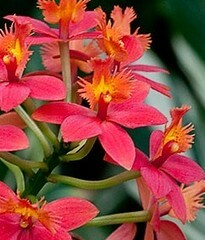 For example, Epidendrum radicans is a reed-stemmed orchid that grows like a weed on the roadside in Central America. The blossoms cluster at the end of a 15 inch long inflorescence and open to reveal huge, fiery-red blooms. They bloom heavily over a long period of time, prefer warm to cool temperatures and a growing medium of terrestrial orchid mix. Epidendrum cnemidophorum (syn. pfavii), also known as “Purple Gum Drop” is another showy member of the Epidendrum genus. This flower is an epiphyte native to Costa Rica that produces upright canes (as high as 4 feet tall) topped by an abundance of 2 inch pink and purple blossoms. It will grow mounted on bark or in coarse, well-drained media. This plant craves moisture and fertilizer all year round, but the results are worth it. In addition, inflorescences on this plant can rebloom, so you shouldn’t cut them off. When all is said and done Epidendrum orchids are a perfect choice. They’re easy to grow, diverse in shape and color and can handle less than perfect conditions. All you have to do is decide which ones you like the best.